Aperture Priority – Useful when the source of light in your photo is the sun, or other ambient light, rather than a flash. 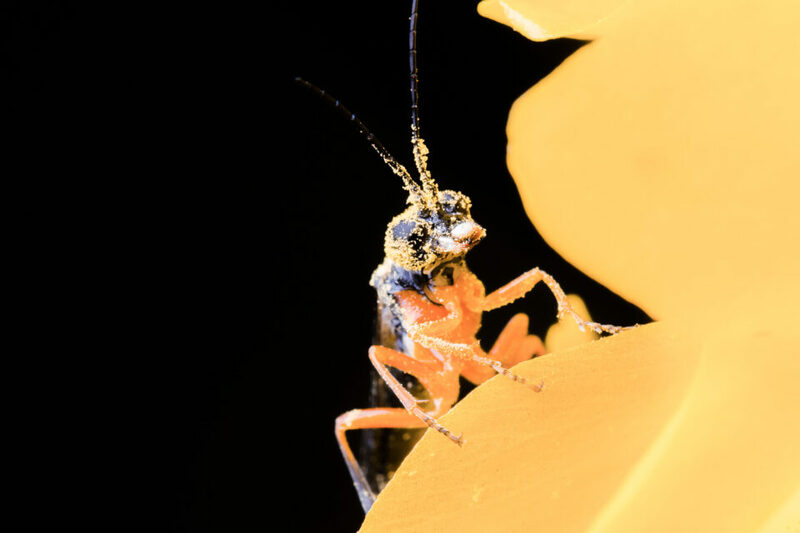 However, keep in mind that it isn’t always realistic to do macro photography without a flash. 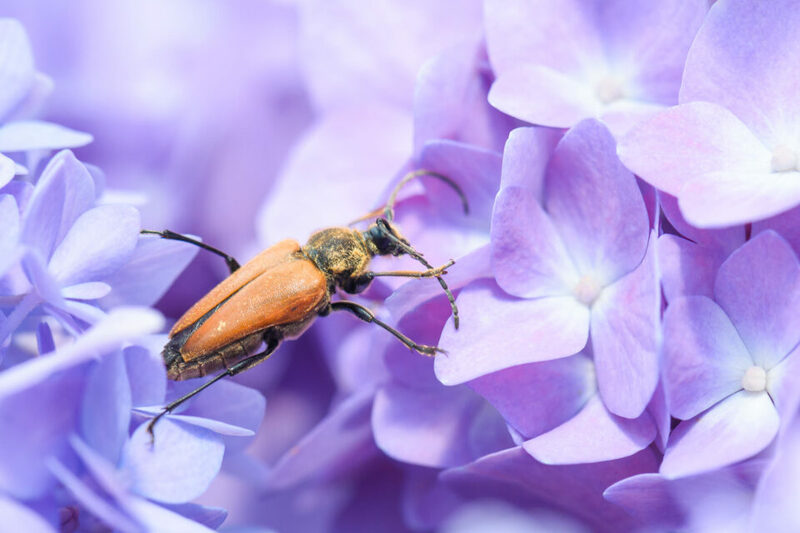 Manual Mode – Necessary when using a flash for macro photography, or when shooting from a tripod under natural light (such as focus stacking several photos together). I recommend avoiding the “Macro” or “Close-up” scene modes that some cameras have. Although these are better than the default Auto mode, they aren’t flexible enough to deal with tricky macro scenes, especially when you are using flash. Also, do not use shutter priority mode for macro photography. You don’t want your aperture to change sporadically as you move in and out of shadows. It is important to control aperture for yourself. The first setting you need to adjust is your aperture, also known as your f-number. This is one of the most critical settings for macro photography, since it directly changes your depth of field. Macro photography has very minimal depth of field – paper thin, and it gets worse as you focus closer and closer. With macro lenses at their closest focusing distance, you’d be lucky to get an entire ant head to appear in focus at once. Your best chance of capturing sharp photos is to pick your aperture very carefully. So, what aperture should you use for macro photography? It’s a tricky question. On one hand, the optimal aperture depends on your source of light. With a flash, you’ll have enough light to use very dark apertures like f/16 or even f/22, boosting your depth of field. If you’re not using a flash, you might need to resort to a brighter aperture like f/5.6 or f/8, even though it quickly diminishes your depth of field. As covered above, you won’t have enough depth of field for high magnification photography unless you use dark apertures like f/16. In turn, that means you’ll want to use a flash. A flash also cuts down on motion blur, whether from your camera or your subject. It’s one of the most important pieces of equipment for macro photography. But what flash settings should you use? I strongly recommend using automatic (TTL) flash in combination with manual mode. That way, you pick your aperture for depth of field, but still enjoy the benefits of auto exposure to compensate for changing conditions. In order to capture a bright enough photo, you might need to adjust flash exposure compensation quite a bit. I often use a flash exposure compensation of +2 to +3 stops for high magnification macro photography. Flash can be very harsh for macro photography. You’ll want to use a flash diffuser to soften the light and avoid specular highlights on your subject. If you’d rather not buy one, you can make a flash diffuser pretty easily out of tape, cardboard, and a paper towel. See our complete article on macro photography lighting for more details. Interestingly, when you use a flash with macro photography, the background of your photo may turn dark or even completely black. This is because the subject – being so close to your flash – receives many times more light than the background. With a flash: Your shutter speed setting is not especially important. Set it to 1/200 or 1/250 second (or whatever your fastest sync speed may be) purely to block out ambient light. It won’t affect the brightness of your flash, because your flash is over in far less than 1/250 second. Without a flash: It is critical that your shutter speed is fast enough to prevent blur from camera shake and subject motion. I recommend using 1/400 second or even faster if possible. You might get away with a longer shutter speed if you have image stabilization and your subject is large, but don’t push it too far. I can’t stress enough that blur is highly magnified for close-up photos. You certainly can get great macro pictures without a flash, but you need to watch this setting carefully. With a flash: ISO is deeply intertwined with flash for macro photography. Specifically, it’s common for flashes to struggle outputting enough light for macro photos (since your aperture is so narrow). It’s also a bad idea to keep your flash near full power most of the time; you’d rather keep it around 1/4 power so it recycles more quickly between photos. This is where ISO comes in. Set your flash manually to 1/4 power, pick an ISO that results in a good exposure of a leaf, and then set the flash back to Auto (TTL) mode. Now you know that it will hover around 1/4 power for a typical image. Your ISO will usually be in the range of 100 to 800 for macro photography with a flash. Without a flash: You’re dealing with a fast shutter speed to eliminate motion blur, and a dark aperture to capture enough depth of field. If you don’t have a flash, that only leaves one option for capturing bright enough pictures: ISO. 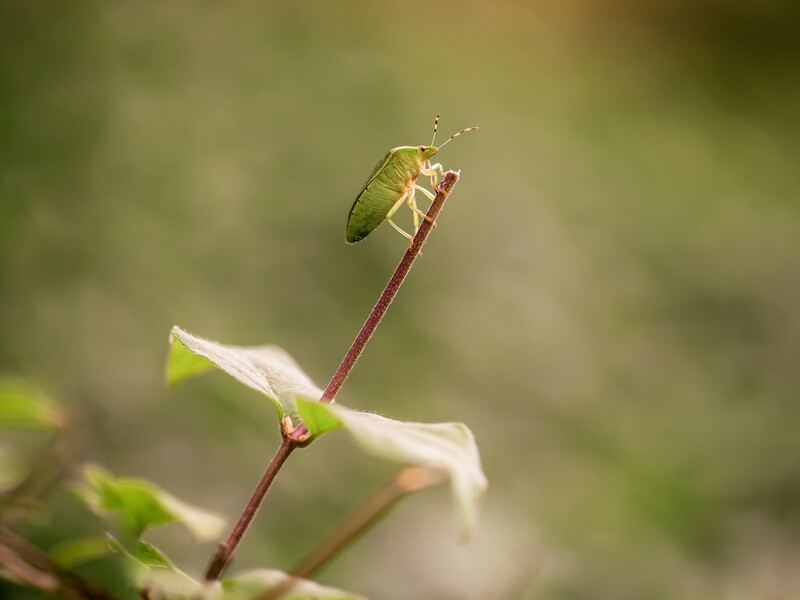 It’s not unusual to use ISOs in the range of 800 to 3200 for macro photography. I recommend using Auto ISO here. Set your minimum shutter speed to 1/400 second and your ISO to 100. This will keep your shutter speed fast enough for sharp photos, while keeping your ISO at a reasonable value, without any mental energy expended worrying about sharpness and ISO for a given photo. The good news is that all the settings so far will remain fairly constant from photo to photo. They are difficult to set, sure – once. But when you’ve set them properly, you’re pretty much done. I take almost all my high-magnification macro photos around f/16, 1/250 second, ISO 800, TTL flash. And for my low-magnification macro photos, I default to aperture-priority mode with Auto ISO 100, minimum shutter speed 1/400 second. Unfortunately, focusing can be more complicated. You’re trying to maneuver a paper-thin depth of field to match your subject, sometimes when it’s moving quickly, all while keeping the composition you want. It’s a bit of an art form, and even the most skilled practitioners will come across subjects with meager of success rates. My main recommendation is to use continuous autofocus for larger subjects at lower magnification. Once you get to high-magnification flash photography, autofocus simply won’t work well enough. Instead, set your camera lens to a given focusing distance, and then sway forward and backward until your subject looks sharp (not easy). Take the photo, and then take several more so you have the best chance of getting a sharp result! We also have a detailed guide to focusing in macro photography that covers these techniques and more. Buy a monopod or find a stick. Get a strong flash, and use a diffuser to soften the light. If you don’t have a diffuser, the best solution is often to make one yourself. Check out our comprehensive tutorial on macro photography lighting for more details. 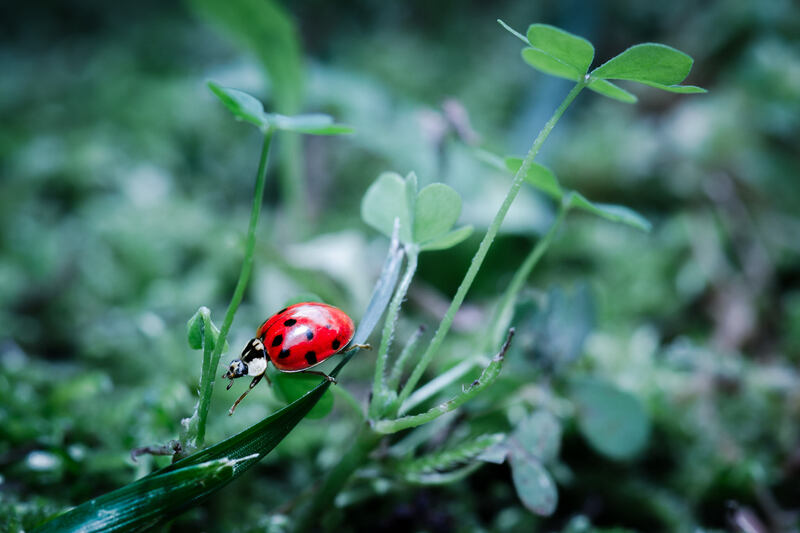 Put a macro lens on your camera and set it to manual focus at your intended magnification. Pick the correct exposure settings so that you capture the enough light. If the flash is your main source of light, and you’re shooting at 1:1 magnification, it is a good idea to use the fastest shutter speed that still syncs with your flash (typically 1/200 or 1/250 second). Use an aperture from f/16 to f/22. Set your flash power manually to 1/4, and manually set the ISO to whatever value exposes ordinary subjects properly, like a leaf. This may take some experimentation. Switch the flash to TTL (automatic) mode. However, even though it’s in automatic mode, you know it will tend to hover around 1/4 power, thanks to step 5. To get an accurate exposure, you will need to adjust your flash exposure compensation, potentially by as much as a few stops. It is not uncommon to have a flash compensation in macro photography of +2 or even +3, but it depends on the flash. At this point, the only “automatic” setting you’re using is auto flash, which will adjust itself depending upon the reflectiveness of your subject. All your other settings – aperture, shutter speed, and ISO – will stay constant. Don’t worry about changing them. Put your camera on a monopod or a stick, assuming that it doesn’t interfere with reaching your subject at the right height. Find a bug that lands long enough for you to photograph it – hopefully, one that is the size of a housefly or larger. Focus manually by swaying forward and backward until your subject looks sharp, then take the picture. Continue taking photos to maximize your chances of success. Watch out for dust spots in the editing stage, and you’re done. Set aperture-priority mode, and pick an aperture that gives you the desired depth of field. This could be almost anything, although I recommend an f-stop around f/2.8 to f/5.6 if you want an especially blurry background. Turn on Auto ISO, and set your Minimum Shutter Speed to 1/400 second. Set Max ISO to 3200. This way, your shutter speed won’t drop below 1/400 second unless you’re in a very dark environment, minimizing motion blur. 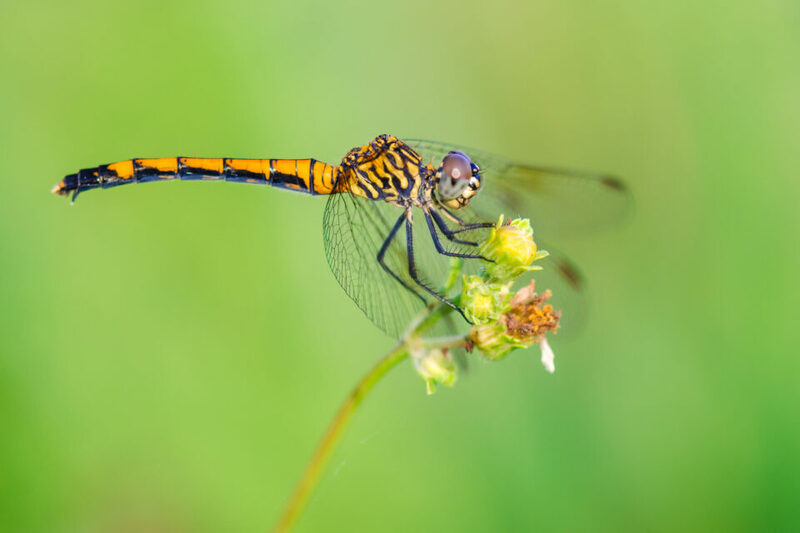 However, if your subject is moving quickly (like a dragonfly in flight), set Minimum Shutter Speed to 1/1000 or 1/2000 second instead. In those cases, 1/400 will not be enough to freeze motion completely. Set ISO to your base value, usually 100 with most cameras. Chances are good that Auto ISO will raise your ISO higher than this, but you might as well set the default to be as low as possible. If your photos are turning out too bright or dark, just change exposure compensation. Use continuous autofocus (AF-C or Continuous Servo) with the focus point placed on your subject, and take the picture. Again, take multiple photos to improve your odds of getting one that is completely sharp. Hopefully this article answers your questions about the best camera settings to use for macro photography. Although macro photography can be a complicated genre, it is also one of the most rewarding. You can take an amazing photo in your backyard on an otherwise ordinary day, or make the most of rain and fog to capture great close-ups. It will take some practice to master these settings, and each sub-genre of macro photography has slightly different requirements, too. There is a lot of information to juggle and keep in mind at once. That said, a lot of these are set-it-and-forget-it settings that you will not usually need to change. And if you have any questions about the best settings for a particular type of macro photo, feel free to ask below. I have loved that lizard image from the moment I saw it several years ago! Thanks for the helpful article. Thank you for the kind words, Michael. 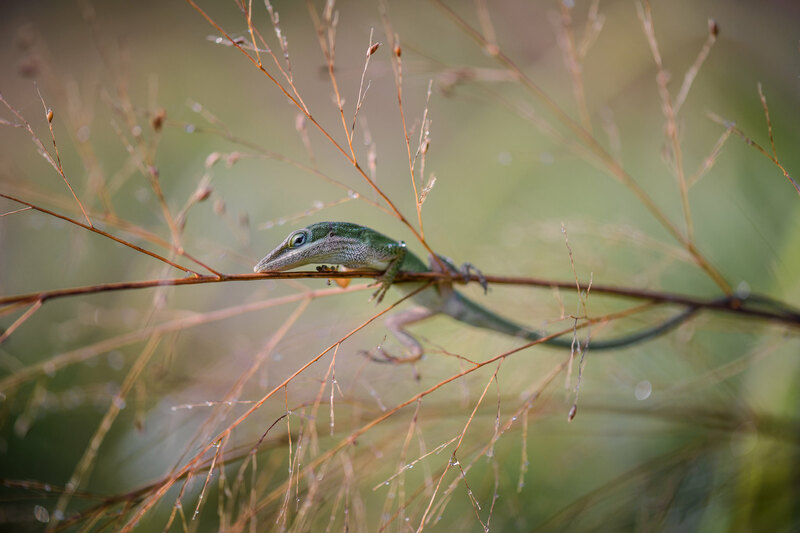 I still consider that lizard to be the most interesting macro subject I’ve ever seen, despite nearly four years that have passed since I photographed it. The dark background when using flash for macro photography is pretty interesting. It can make mid-afternoon outdoor photos look like they were taken in a carefully lit studio. Whether or not that is the goal for your own macro photography is an open question, but I like the sound of your natural light, tripod-based method of photographing static subjects. A very well written article, full of practical and useful advice. I’m happy you liked it, Parang, thanks for the comment. Regarding flash. I have one Nikon SB-910, and my question to you is; Should I use it on top of the camera (you’re talking about TTL, and as I understand it, TTL only works with the flash attached to the camera), or do you suggest that I buy a cable to connect the flash to the cameras hotshoe ? Further more, do you think that only one flash is sufficient ? I don’t think you need to buy a cable to connect the flash, or otherwise use the flash off camera, in order to get good macro photos. (Off-camera TTL is still possible if you use your camera’s own pop-up flash as a commander, or you use a wireless flash trigger/receiver combo like one of the ones from Godox.) And I do think that a single flash is sufficient. I personally use the dual flash Venus Optics KX800 nowadays, but that is more to give myself some extra working space than anything else (since my homemade SB-600 flash diffuser only worked when I kept my lens hood on). Some flashes, such as the SB-910, come with built in diffusers. They slide out of a pocket on top of the flash. Is that the type of diffuser that you are talking about here, or are you talking of some other type of external device? If external, would not the built in diffuser be good enough for macro work? Hi again Spencer and thanx for reply. I’v learned that it is possible to use the flash in i-TTL mode (off camera, I should have read the manual better, but I rarely use flash under any circumstances, for my type of photograpy). I don’t know how familiar you are with the SB – 910, but as Elanie Landsdown pointed out, the SB – 910 comes with a diffusor (but not built – in, rather click – on). What do you think about that one, will it do the job under these circumstances pointed out in the article ? Mr. T, The SB-910 diffuser is built in. They call it a wide panel, but it’s purpose is diffusion. At the top of the flash, you pull out the little tab, and the diffuser and a bounce card will come out. You pull the diffuser down to cover the flash. The bounce card will stay above the flash. The bounce card is for creating a point of light in the subject’s eye when taking a portrait. You can use either one without the other, or both at the same time. The piece that clicks on is a diffusion dome. The diffusion dome is for further diffusion to make light even softer than the built in diffuser does. This is all per the SB-910’s manual. Elaine, what you are referring to, is the built – in bouncercard. That is not the same thing as a diffusor, sorry ;-). No, it is not broken off, I rarely use the flash., it is in mint condition. Everything is there, as you mentioned. As I said, the problem is that I didn’t read the manual properly (my shortcoming ? ), and the somewhat confusing thermology that Nikon uses to describe the wide angle panel (wich obviously is to be used as a diffuser), and the diffusion dome. I just read the manual, since I always have it with me, for obvious reasons ?. Elaine, I stand to correct myself. It’s my own shortcomings that shines thru here. I ‘ didn’t read the manual as I should, and I’m sorry. You’re absolutely right about what you’re saying. What makes it confusing (for me) is that they call it a wide angel panel respectively diffusion dome. But regardless of which, you’re right and I’m wrong, so I do apologise for my shortcoming. the diffusion dome, preferably on a subject that is not inportant, for evaluation. Mr. T, Your apology is happily accepted. I must tell you that I also learned something while doing this research. I have the diffusion dome in my flash holder pouch, but had never looked at it until this exchange. Now I know its purpose if I should need it. Thank you for that! Thank you for accepting my apology ?. Mr T, take a look at my response 4.1.1.1 to Elaine a moment ago – in short, although the Nikon diffuser dome is better than nothing, you probably will get better light overall with a larger diffuser placed closer to your subject. Thanx Spencer, probably missed that post. Keep up a great work ! I bracket the macro shots and select the one with proper exposure. My reasoning is as follows. We can meter and then re frame, and then shoot. In case of Macro, DOF is narrow so while reframing focus may shift off of the subject. For this reason I avoid reframing altogether. I meter to near by nuetral object and then take 5 bracketed shots. This method has saved lot of time also. Timing is important in macro because we have to watch out for light and wind. I’m glad your method has saved you a lot of time, Ramesh. For me, the biggest reason to take multiple photos of a macro scene is depth of field – especially handheld with moving subjects, I find that only a fraction of my photos are perfectly sharp even in the best of cases. Thanks for sharing. Very useful information . I love all the pictures I plan on using this and all of your references. Thank you for the detailed article. I am new to DSLR photography and trying very hard not to use the scene modes. Many articles say that settings will depend on conditions, etc. I really appreciate you giving specific settings that give me a strong starting point. Seeing your photos makes me want to go out and start shooting, but since it is dark and snowing here in Seattle right now, I will wait until tomorrow. What is your take on the depth of field preview button (not available on all cameras)? I have found a DOF preview button to be indispensable for macro work. Used in conjunction with a tripod-mounted camera, it allows me to assess the degree of sharpness of the background prior to creating a macro image. I once heard John Shaw say that a DOF preview button was so important to him (he creates a lot of macro images) that he would never consider purchasing a camera that didn’t have one. What is your take on the depth of field preview button (not available on all cameras)? I have found a DOF preview button to be indispensable for macro work. Used in conjunction with a tripod-mounted camera, it allows me preview and control the degree of sharpness (or blurring) of the background prior to creating a macro image. I once heard John Shaw say that a DOF preview button was so important to him (he creates a lot of macro images) that he would never consider purchasing a camera that didn’t have one. What is your take on the depth of field preview button (not available on all cameras)? I have found a DOF preview button to be indispensable for macro work. Used in conjunction with a tripod-mounted camera, it allows me to preview and adjust the degree of sharpness (or blurring) of the background prior to creating a macro image. I once heard John Shaw say that a DOF preview button was so important to him — he creates a lot of macro images — that he would never consider purchasing a camera that didn’t have one. Sorry for the multiple posts. My computer was malfunctioning and gave me the false alert that the posts had failed. I love the images and the idea of macro photography so thank you for the instructions nd tips these are great. I have a nikon d750 i dont have an array of lenses i have a 50 mm f1.4 and a 70-300 f4.5 vr. I have quite significant hand tremors due to medication with my changing medical conditions. I have a good tripod so use that a lot. what i would like to know is what would be the best flash and lens to buy to be able to shoot maco please. No answer for your question but since you already have a 50 mm /1,4 lens, perhaps it is enough if you buy a set of rings that you could attach between the body and the lens, in order to achieve a magnification. In such way you wouldn´t be in need of spending to much money on a new macro lens (unless you really want to have one, ofcourse). I think a set of good quality rings comes for less than a $ 100. Concerning flash I leave to others to recommend, but quite often Godox and Yongnuo is mentioned as a good quality budget alternatives. Whatever the outcome of your choice will be, I wish you good luck ! I used to have a D600 and a D610 and now moved to two D750 so we are usind the same camera. Originally I had a Nikon 105/2.8 Micro. Because format change and the balance on the tripod was somewhat annoying I combined it with a tripod collar especially made for this lens by a guy called Rainer Burzynski here in Germany. My friend (pro) then recommended some alternatives to me. One was the “old” version of the Sigma 150/2.8 (Old in this context means the version without VR). I didn’t try that one because I had more of a problem with objects trying to escape because coming too close. Now I use the other “oldie” that was recommended: A Nikon AF 200/4D. There very few opportunities I hat to use made me falling in love with it. Sharpness, contrast n colors are superb and according to people with much more expereince thatn I have still among the best you can get. It is built like a tank and thus really, so grabbing and holding it during setup might be a bit more difficult after what you told about your hands. But once it is on the tripod it balences quite due to its weight cvompared with the camera itself. However, there is one thing that has not really to do with the camera setting in the sense of menu parameters, but is certainly very important as well. What is your opinion / prefence if it comes to precision of focussing depending on the visualisation device and the AF mode. For still images with MF I used the normal viewfinder without or – in bright light and/or close to the ground – in combination with an add-on like a DR-6 with a 2x magnification. After going to D750’s with the flexible display I started using display with Live View without or – in bright light and/or close to the ground – combined with an add-on like the LCDVF from Kinothenik, which also provides mganification. I must admit that I do not have the time for my hobby very often, so it might have something to do with lack of practice, but I really struggle if it comes to use AF for macro. Can you tell a bit more about the setting if using AF-C (S, d9, …) or even AF-A ? You mentioned that ‘Canon calculates aperture differently than other brands in high-magnification macro photography’. 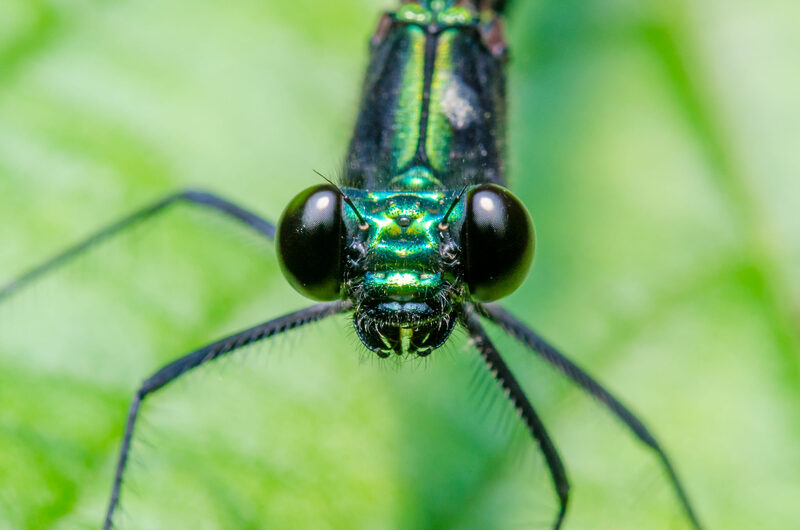 I have been doing macro photography with Canon 35mm SLRs and full-frame dSLRs for many years (I currently use the 5D Mark IV and Canon’s 180mm macro lens). But I have never read or heard anything about Canon calculating aperture differently. Can you be more specific? How does Canon calculate aperture, how is it different from other camera manufacturers, and how would that impact my photography in high magnification macro work? That’s really informative post. I appreciate your skills. Thanks for sharing.